Garlic Shaker has created a simple way to peel garlic without the hassle. With their recent Kickstarter campaign launch, I spoke with Co-Founder of Garlic Shaker, Matthew Ramos, about their amazing product, building a community, and how they run their e-commerce business. How did Garlic Shaker start? Have you ever heard people say they started their business on a cocktail napkin? Well, ours started during a conversation on a fishing boat, and the planning began in a tequila bar at the port. We believe Garlic Shaker® is a great idea, and a great product, that has a great story that started it all. Garlic Shaker® began during the greatest fishing trip of our lives. We fondly refer to that weekend as the “catching trip” because we caught so many fish we could hardly eat them all (in case you are wondering, we managed). Adam said, “I’ve got this exciting idea for a device that can peel garlic quickly.” The response was enthusiastic as the boat motored back to port, “if you know an easy way to peel garlic cloves, we are all ears!” Upon our return, Adam sent us a video demonstrating how to peel garlic with the device. Needless to say, we were blown away! The holy grail of easy peel garlic had just been solved in a mere 30 seconds! We couldn’t believe he’d figured out how to peel garlic so fast. We were truly in awe! A garlic peeling session would never again be such a slow painful task. 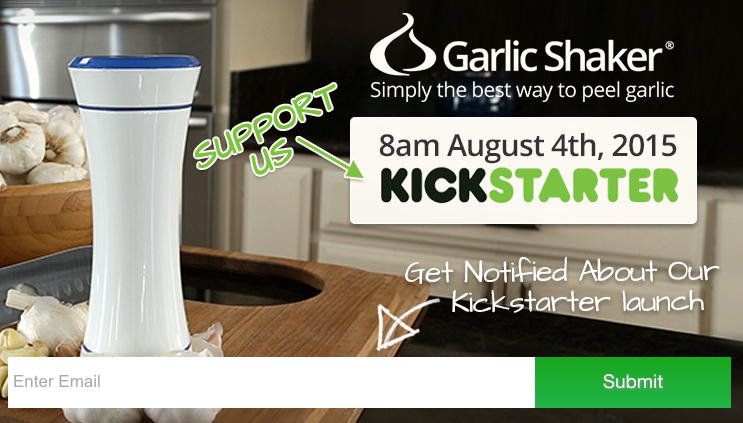 And so the journey to create the Garlic Shaker® began! What are/were your initial keys to success? Peeling garlic is a very annoying, time-consuming process that makes cooking less enjoyable. We made a great product that solves a real problem. We also used the internet to create demand before we build the supply by promoting the Garlic Shaker before going into mass production. Can you talk a bit more about the community around your product and how you went about building it? We tested engagement on virtually every major platform. What has worked the best for the Garlic Shaker is PPC advertising on Facebook, SEO for organic traffic on Google, socializing on Facebook, Twitter, Pinterest, and Instagram. We post a lot of content that we think people who are into garlic and cooking might enjoy. We give away a free cookbook full of garlic recipes for their email addresses. Why are you running a Kickstarter campaign? To fund the company’s ongoing and future operations, sell the product, and raise brand and product awareness. Garlic Shaker is a new way of peeling garlic so we also hope to educate the consumer about this new alternative to peeling fresh garlic. 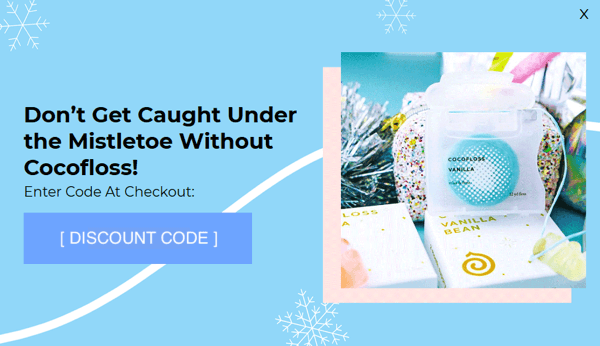 How have you benefited from using Overlay Promotions (Justuno)? Using Overlay promotions has drastically increased our email signups which are key to our success. Before using Justuno, we had just 220 email subscribers. After implementing the promotional overlay through Justuno, we’ve grown our list to over 20,000 contacts! 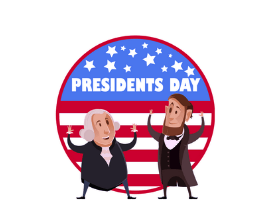 Justuno is responsible for 80% of all our email subscribers and continues to help build our business daily. With our free recipe book promotion, we’ve acquired high-quality leads that are interested in our content and products. 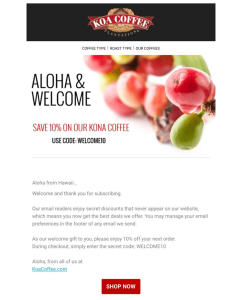 Before using the overlay promotions, we were experiencing email open rates around 1%. Now our open rates are hovering around 23%. How are you planning to use overlays to maximize your Kickstarter Success? We think the new design functionality of the Justuno platform is really going to help us drive users to the Garlic Shaker Kickstarter campaign. 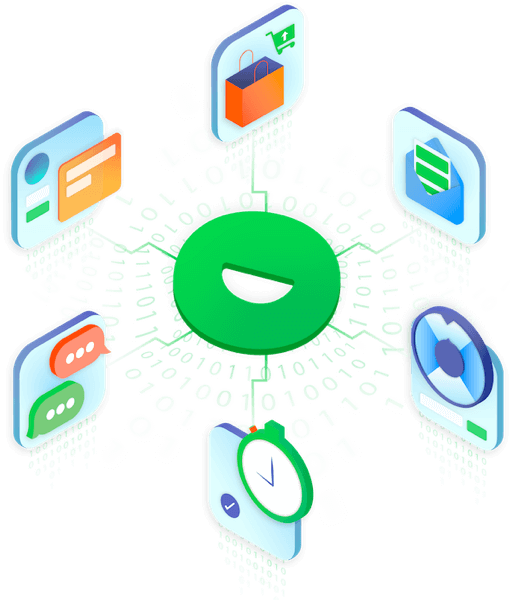 Also, the data Justuno has provided us for optimization has been very helpful to make sure the user experience is pleasurable and not annoying. We as a company take user experience very seriously and so does Justuno which we really like. What other e-commerce tools do you use? BigCommerce is our content management system. We use Mailchimp for email. We use Norton SSl certificate for security and Vimeo to host our videos. We are a highly social company so the Garlic Shaker is very active on Facebook, Twitter, Pinterest, Instagram, Youtube, and Google+. Any advice for new e-commerce entrepreneurs? Out user experience first and try to create and design interesting and engaging content you think your audience will enjoy. Most of the content won’t do much, but don’t get discouraged because by creating testing you will eventually find your audience and be able to give them what they enjoy. The better you get at giving first as a company the more active your users will become. We learned all of our demographic data from creating content and pushing out through social media. There were a lot more surprises than we anticipated. We also now know exactly what our audience likes, so we can focus on creating more content that we know our users will enjoy. That way we don’t waste time or resources creating content that doesn’t work. People want to be entertained, educated, or usable information. At least in our experience. Garlic Shakers fan base like recipes and videos. We intend to focus more in those areas as we create new content. If you want to successfully build a community and see results from content marketing, you need a direct channel to market to interested parties. Email is still the most effective way to directly reach people with your message and converts at a higher rate than both social and PPC. It‘s time to make this a priority so start building your list today! One of the reasons, besides a killer product, that the garlic Shaker has been so successful is the ability to create a community around the product. 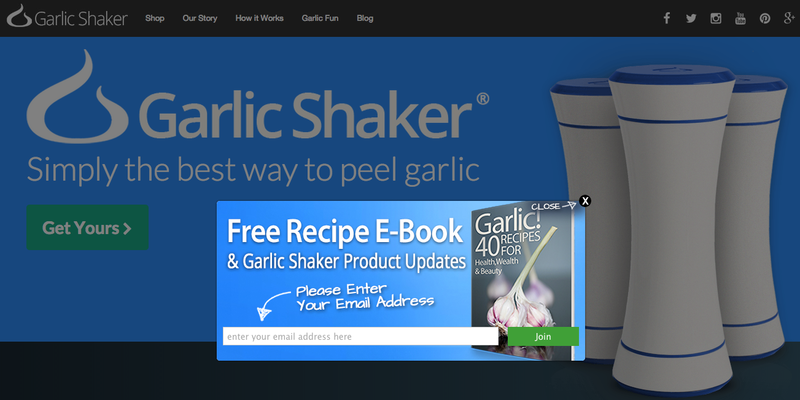 Using social and PPC ads, the garlic Shaker team has been able to display their product, brand, and content to a focused audience. This has allowed them to see product demand before investing in supply. Their recent Kickstarter campaign is just another example of continuing to build a community. The best time to start creating content is now. Get your feet wet and figure out what works and what doesn’t work for your company. Content marketing is an ongoing process and you’re only going to get better at it. Write up some posts, see which ones perform the best and replicate that success. It was an absolute delight to talk with Matthew about Garlic Shaker. I and the rest of the Justuno team are thrilled to be working with the up and coming brand. If you like garlic but hate peeling it, show Garlic Shaker your support!